Perky Pecan Pie for sale. Buy online at Zingerman's Mail Order. Gourmet Gifts. Food Gifts. 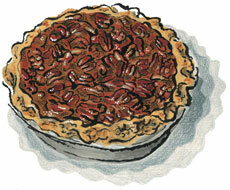 Pecan pie is the one of Southern cooking’s best diplomats. It’s hard to find folks who won’t dig into a slice placed in front of them. That said, there are good pecan pies and there are great ones. The better versions take care with the details. Real butter in the crust. Great brown sugar—ours is organic and natural, from Mauritius—for the filling. Loads of toasty pecans. Our pie bakers stuff in so many pecans—whose flavor really comes forward when roasting while the pie bakes—that there’s barely enough room to fit them in, let alone any of the caramelly brown-sugar custard. Zingerman's pecan pie has a warm, balanced flavor that's never too sweet. "Consider this Southern Gal completely converted to your amazing, incredible, delectable, delicious Toasted Pecan Pie. Worth. Every. Penny. Worth. Every. Calorie. As God is my witness, let no other pecan pie pass my lips again!" Cradled in a re-useable embossed metal pie tin and nestled in our handsome wooden crate or cartoon cardboard gift box.